The ATS War Belt offers a fresh perspective on the padded first line belt. Long gone are the days of an old LC-1 belt with a cobbled together padded backing. 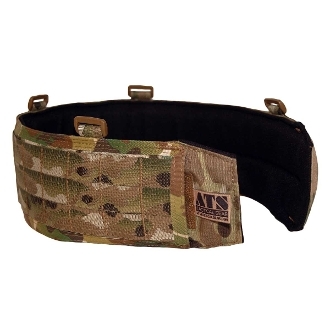 The ATS War Belt is a padded cover that is designed to be used with a belt system up to 2" in width. The inside of the War Belt is lined with a strip of 2" wide hard side (male) Velcro to interface with duty belt soft side (female) Velcro to keep the belt from shifting during hard use. It offers full length 1/4" high-density, closed cell foam padding for comfort and is lined with Dri-Lex moisture wicking material on the inside of the belt. There are 4 ITW/Nexus 1" Looplocs on the top edge of the belt for using the optional suspenders. The outside cover of the War Belt is bar tacked with three stacked rows of PALS webbing for use with any MOLLE compatible pouches. The outer cover is opened along the bottom, allowing access to the duty belt within (belt not included). This allows the user to hang pouches, holsters, and drop-leg hangers that are not MOLLE compatible anywhere along the inner belt. The padded belt is sized to work with our ATS War Belt Liner Belt or Cobra Rigger's Belt (Large with Large, etc.). As with all our products the ATS War Belt is made in the USA and comes with a lifetime guarantee. The ATS War Belt is available in Multicam, Coyote Brown, Ranger Green, and Black. Three helpful hints for the War Belt: first, a side release buckle inner belt is easier to get on and off. Second, if the belt you're going to use is lined with Velcro, get yourself some shims made of cardboard or magazine covers (the heavy glossy paper works great) and cover the Velcro inside until you get the belt where you want it. Then just pull out the shims, give the belt a smoothing push to seat the Velcro, and viola, perfect belt insert job. Third, before you put the belt in, make sure any hanger you want on it, like a Safariland UBL or other such part, is already on the belt before you Velcro that belt in.